The Galaxy Xcover takes connectivity a lot more seriously. It’s a worldwide ready phone with quad-band GSM/GPRS/EDGE and tri-band HSPA with download rates of up to 7.2 Mbps and 5.76 Mbps of upload. It additionally offers Wi-Fi (b/g/n), stereo Bluetooth v3.0 and USB v2.0. The USB interface is standard microUSB, which makes finding a suitable cable a lot easier. The amount of in-built storage memory is a measly 150MB but combined with the added support for microSD cards of up to 32GB you’re all covered. The slot is under the battery cover however. A standard 3.5mm headphone jack completes the tally. You can keep your favorite headphones and use them with the Galaxy Xcover hassle-free. The important thing to mention here is that the Galaxy Xcover lacks Adobe Flash support but this could change before the phone is released. Still, we’re not really sure its exotic CPU is on the Adobe Flash support list. With a page fully loaded, all you see is the URL bar and the bookmark button on a line at the top of the screen. Once you zoom in and pan around even that line disappears (scroll to the top or press menu to bring it back). We have to admit that surfing the mobile web on the Galaxy Xcover isn’t the best thing. Yes, it has a big enough screen but just not crisp enough. The lack of relevant outdoor apps aside, the Galaxy Xcover offers the must-have apps to spare you a visit to the Android Market. Naturally, there’s the calendar, calculator and more basic apps. But you also get a file manager, courtesy of Samsung, which works great and is very simple to use. You can also find the well-familiar by now Notes application, which is a part of the TouchWiz experience. The combination of rugged exterior and smartphone prowess is not unheard of. It can be traced all the way back to the glory days of Nokia and Symbian. But putting contemporary skill and features in a rugged touchscreen shell is an entirely different story. 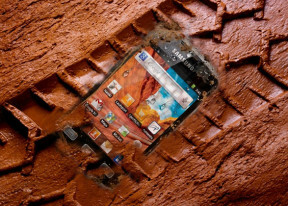 The Samsung Galaxy Xcover is trying to fill vastly different shoes and pays the price. The Galaxy Xcover is a phone based on compromise. The display loses quality points because it's durable, the camera is poor to keep the price down, the design has its ups and downs too. To make it worse, the major competition is closing a lap on it with not one but two rugged droids offering superior features. With the Motorola Defy pair in mind, Samsung will probably position the Galaxy Xcover at the lower end of the midrange. That’s where compromises are easier to live with. And what it has in its favor is the solid connectivity set and good all-round user experience with the latest version of Android and TouchWiz. We'll be waiting for a final version to be able to cover more ground in detail. And we certainly hope this rugged droid will come good. This is still a pre-release unit and many things didn't work properly, not to mention our stress test was a bust. We'll keep you posted.